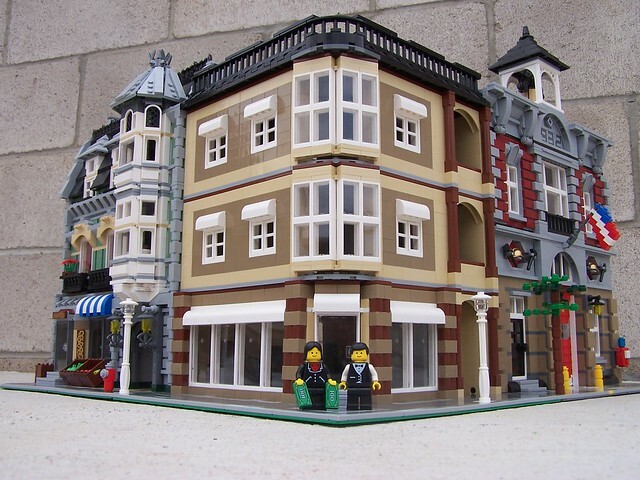 Brick Town Talk: Cast Iron Corner - LEGO Town, Architecture, Building Tips, Inspiration Ideas, and more! Business District- (BTT) While this building may not have as many precise details as an official Modular set, it sure makes up for it in overall appeal. Somehow, the dark red, and two shades of tan, with black highlights seem to give this building a highly desirable character. It has a very unique facade, using bricks that appear to be plates and tiles snotted together, and with and interesting, angular bay window corner. Not only does it look good alone, it matches exquisitely with the existing modulars, and a suitable replacement for a certain Cafe.